They are bursting with healthy, nutritious flavours and textures! 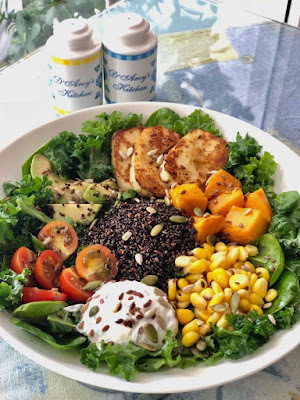 Fresh greens (kale, baby spinach and baby rocket leaves) with black quinoa(Gluten-free), grilled Halloumi cheese, roasted butternut pumpkin, minted labneh, sweet corn kernels, juicy cherry tomatoes and avocado. Served with Lemon Olive Oil dressing and sprinkled with toasted pumpkin-, flax- and sunflower seeds! They cost RO 4.9 and are available at D'Arcy's in Shatti. You can always check out D'Arcy's facebook page here too.